Island Karst Research is involved in exploration, mapping and research of caves and karst across western Canada. British Columbia has most of the largest, longest and most beautiful caves in Canada. Exploration and mapping by caving clubs is ongoing. In the vicinity of Tahsis, the home base for Island Karst Research, over 50km of caves have been explored since the 1970's; the deepest is 479 metres. The deepest cave in Canada is currently 670m deep while the longest is over 21km. Above: White Rabbit Cave. Expeditions to this remote cave in the Monashee Mountains have so far explored it to a depth of 459m but the cave is continuing. 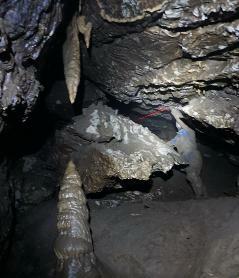 Ultrasonic bat detectors have indicated bat use of this cave. Below: Skypot, a 30m deep entrance to the Weymer Cave System. This cave was first explored in 1991 and is currently 13.6km long and 370m deep with 27 known entrances. Work by Island Karst Research demonstrated that at least four species of Myotis bat hibernate in this cave. Due to its significance, the area is protected as a provincial park. Below: Blade Falls at the Smattering Karst. This 50m high falls enters a cave at its base. It can only be entered in summer low water.